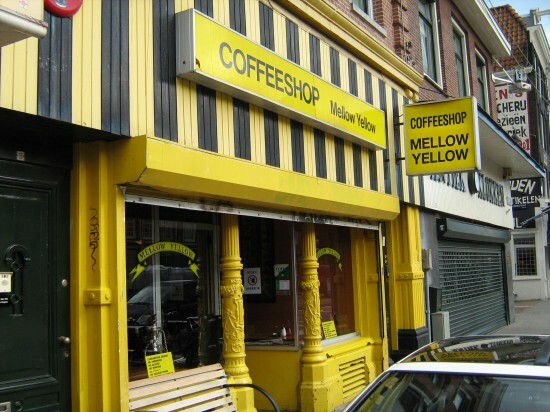 Coffeeshop Mellow Yellow was the first coffeeshop in Amsterdam ever! It was established in 1970 by a connoisseur called Wernard. The original interior was torn out, and is replaced by a much more commercial countenance. So today this isn’t a coffeeshop you pick for the nice interior and great ambiance, but it’s a coffeeshop were a lot of locals come to chill and smoke. It almost seemed that a couple of friends run this place cause downstairs the coffeeshop was filled with local guys who they all apear to know. The staff however is real friendly and give you all the time and advice you need to pick out your order. They know what they’re talking about! I sat upstairs where they didn’t have ventilation. So it was smokey and hot. Like I said before the ambiance could be better, they should decorate the place with art or some spacey items. I bought a gram of “pot of gold”, that wasn’t really nice. The flavor was dissapointing and the high was mellow like the shops name. I’m visiting Mellow Yellow again soon to check out some other products. You should also! Time : 09:00 till 01:00 from sunday till thursday, 09:00 till 03:00 on friday and saturday.